Mauritius, Africa, 2019-Jan-30 — /Travel PR News/ — From March 6 to 9, 2019, Four Seasons Resort Mauritius at Anahita is set to welcome nine acclaimed French and Australian guest chefs for a four-day culinary showcase of live demonstrations and exclusive experiences, culminating in a live Star Chef Cooking Showdown at Bambou Beach. In partnership with the Resort’s culinary team led by Executive Chef Nicolas Vienne, each event across the four days will offer insights into different ingredients, cooking techniques, culinary pairings and international flavours, all designed to engage and inspire diners and fellow chefs alike. Signature Sips: Adding to the evening’s Happy Hour Menu in O Bar, a signature selection of cocktails, wines and Champagnes will be available. Meet and Mingle: The event’s guest chefs and Resort’s management team will gather in O Bar for a chance to interact with all Resort guests over a choice of complimentary wines and cocktails. David Rathgeber – A connoisseur in traditional French cuisine, Chef Rathgeber honed his skills under Alain Ducasse, who served to be his mentor for more than five years. Working in a number of Ducasse’s global restaurants – from Louis XV in Monaco to Essex House in New York – Rathgeber went on to support the expansion of the group into Asia, namely in Osaka and Tokyo. He was awarded his first Michelin Star at Ducasse-owned Benoit, Paris, in 2006, before taking the reins at the historical Lulu Rousseau, ahead of establishing his own Parisian bistro, L’Assiette. Didier Corlou – Having had the opportunity to travel and work internationally since a young professional age, Chef Didier Corlou soon became inspired by exotic spices and fruits of Africa, Asia and distant islands. Establishing himself in Vietnam in 1991, Corlou has not looked back since. Now boasting a total of five restaurants in Hanoi and a number of cookbooks to his name, his cuisine has become famous for marrying French ingredients with Vietnamese taste. Hervé Rodriguez – Originally from Dijon and now based in Paris, Chef Rodriguez is of Spanish origin and through his curiosity to discover this heritage, he has learned to explore the cuisines of not only Spain, but around the world, paying close attention to the visuals of how a dish is created. Bold and passionate in his approach, Chef Rodriguez has worked at no less than three Michelin Starred restaurants, including his own MaSa Restaurant in Paris. Patrick Jeffroy – Frequently travelling internationally to promote and showcase French cuisine, Chef Patrick Jeffroy has developed an in-depth knowledge of his native cuisine from a career working across multiple regions of France. Alongside his passion for signature French cooking, Jeffroy takes inspiration from nature and the simplicity of its purity. First awarded a Michelin Star in 1984, his second followed in 2001, which then became two Michelin Stars for his still current restaurant at L’Hotel de Carantec in Brittany. Michel Portos – Hailing from Marseille, Chef Michel Portos was not originally destined for a life in the kitchen, with his father keen for him to follow in his footsteps of accountancy. However, his natural desire for cuisine won out and he began his professional journey in Bordeaux under the guidance of Michelin Star chef Michel Gautier. Time in Toulouse and Perpignan followed, where he was awarded his first Michelin Star, with his second to follow at Bouliac in Bordeaux in 2009. 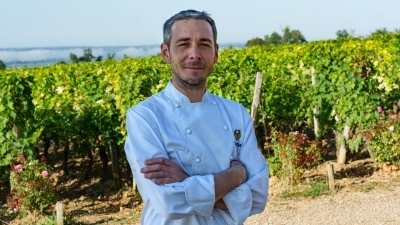 Michel Portos was named “Cuisinier de l’année” in 2012 by the Gault Millau and now runs two restaurants, Le Malthazar and Le Poulpe in his home city of Marseille. David Charrier – Having worked in the kitchens of fellow Star Chef Patrick Jeffroy at L’Hotel de Carantec, David Charrier has since established his own culinary identity, with a focus on seasonal dishes and ingredients. Chef Charrier was awarded his first Michelin Star in 2016 for his current restaurant Chateau Troplong Mondot’s Les Belles Perdrix in Saint Emilion. Xavier Thurot – Growing up in Brie, France where his parents were dairy breeders, Xavier Thurot, was immersed in the world of cheese from a very young age and has since developed an encyclopaedic knowledge of the subject. Passionate about cheese variety and use in cuisine, Xavier still lives in Brie today, while travelling the world to share his expertise. Mike Tafe – Passionate about the finest Australian produce – from red meats to the purest herbs and spices – Mike Tafe is the Corporate Chef for Mulwarra Export, recognised as Australia’s leading supplier of premium Australian produce to five star hotel markets internationally. Having begun his career studying hospitality management, Mike Tafe went on to be awarded Australian Apprentice Chef of the Year in 1981, before a series of positions in some of the world’s top hotel kitchens led to him opening his own restaurant in Sydney before continuing to share his passion for his native cuisine through his current role as a corporate chef. To find out more about Star Chef or to make a reservation for one of the Resort’s pool villas during this time, contact: reservations.mas@fourseasons.com. This entry was posted in Business, Festivals and Events, Food & Drinks, Hotels, Resorts, Travel, Travel Services, Travelers and tagged Anahita, Australian, chefs, Chef Nicolas Vienne, culinary, Four Seasons Resort, French, Mauritius, showcase. Bookmark the permalink.